Hi, I am interested in your 1997 Bentley Azure (stock #4700-ATL) listed on Autotrader for $59,995. I'd like to get more information about this vehicle and confirm its availability. Opportunities like this dont come along very often. When Bentley Azures first rolled off the assembly line over 20 years ago, they fetched a sum well out of reach of all but the most affluent buyers - over a half million dollars when adjusted for inflation. Small wonder that only 1400 Azures were built during their entire 9-year run - thats 155 per YEAR. Fast forward to the present and catch a glimpse of this 1997 Bentley Azure. It captures every bit of that ultra-luxurious Bentley magic, is unusually lightly travelled, runs and looks great and can be had for a fraction of that price. Unabashedly opulent, this is a ride that makes quite an impact. Its still clad in its original color - a shade of burgundy thats as classy as it comes - and harbors a close resemblance to the Bentleys of today in a number of respects, including its muscular form, compact front grille and body colored headlight casings. The paint is original and has held up impressively well and still offers a great shine - a thorough detailing session will have it re-ascending to its accustomed lofty level. You cant help but picture yourself holding court from behind the wheel, motoring down the boulevard on a sunny day, but for those times when the weather doesnt cooperate, the tan power convertible top rises into position without a hitch. As befits automotive royalty like this specimen, its been kept in entirely stock condition throughout and its trim is good shape, looking nice and sharp against its rich backdrop. While there may have been similarly sized luxury cars roaming the streets a number of years before it, you wont find any with the fortified construction this icon features - its so well reinforced throughout that its roomy, open air cockpit comes at no expense whatsoever to structural rigidity. The tan leather interior shows all the hallmarks of luxury youd expect from a car of this stature. The spacious front buckets offer outstanding comfort, combining graceful contours and plenty of padding for an experience you wont soon want to disembark from. There are burlwood accents all over the cabin - encompassing most of the dash, topping the doors on both sides and gracing the center console - and all of it has come through the years in strong fashion. Youll immediately be taken by just how much room there is inside these doors - your backseat passengers will have an abundance of both leg and shoulder space. A thorough assortment of instrumentation is laid out across the dash - all of it functioning just as intended - and the climate control system is running in top form to bring cool or warm air into the cabin as needed. Driver and passenger airbags provide an added measure of safety while on the road while the included anti-theft device helps keep this one of a kind ride in your possession. Standing by beneath the hood is a 6.75 liter turbocharged V8 that provides plenty of power - resulting in both an impressive top end and, far more surprisingly, off the line acceleration youd likely think would be out of reach for a car of this size. The powerplant sits in a nicely detailed engine compartment - every surface inside is clean and theres not so much as a wire out of place - and it teams with a very smooth-shifting automatic transmission to provide an outstanding driving experience. Light yet responsive power steering makes for easy navigation - this Bentleys agility will no doubt impress you. Power disc brakes at all four corners bring prompt, dependable stops as this storied vehicle cruises on its set of original 17 alloy wheels wrapped with Goodyear Eagle tires. 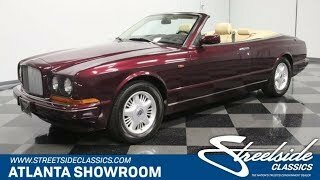 This 1997 Bentley Azure makes the seemingly unattainable attainable and offers unparalleled prestige for its next lucky owner. Call today!